Also, I found the old Sargeant on the right. He was painted and highlighted about three years ago, but fits in perfectly. So perfectly, in fact, that I'm tempted to replace the original Sarge on the left. So, I'm throwing it out to you, my readers. Which one do you think I should choose? And to end, some Command Squad progress. 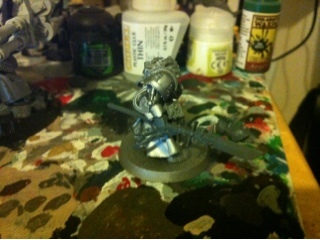 This Apothecary is built using the Ravenwing Command Sqaud parts, and I found an old pair of kneeling legs which looked really cool, so on they went. Makes him look like he's covering a casualty...which is the effect I was going for. That's something I love about Marines...there's so many parts for them you can create action filled poses without really trying! Courage of the Lion now only applies to Leadership tests for morale. Nothing more to say. Stasis Anomalies and Vast Stasis Anomalies don't stack together. I guess this was a big issue? Not having used a Dark Talon I can't say I ever thought about it. vehicle” - This always seemed likely to me, however I would have thought they would have let the vehicle itself have the PFG's save. Seems like GW have broken their own rules on area effects when boarded on vehicles, but as I haven't really dived into the world of PFG's it's not something I'll miss. Asmodai finally gets a bolt pistol. Really not ever going to make me take him, but at least he can use more than harsh language at range now. Ravenwing Command Squads - Well, this is the biggie here. An extra two Black Knights at 40 pts each!! this means that you can have a few bikes drop before your Standard of Devastation gets killed. Really don't see how anyone would consider taking other command squads now. 295 pts gets you 4 Knights, an Apothecary and the SoD. A little expensive maybe, but you have a banner that can be put where you need it, multiple saves and FNP, and can be used to redeploy and Plasma Talon anything that threatens your gunline. To me that's an autopick in most lists in place of any Black Knights if you have any characters on a bike or Sammael. Deathwing Assault units do now count towards your 50% reserves. 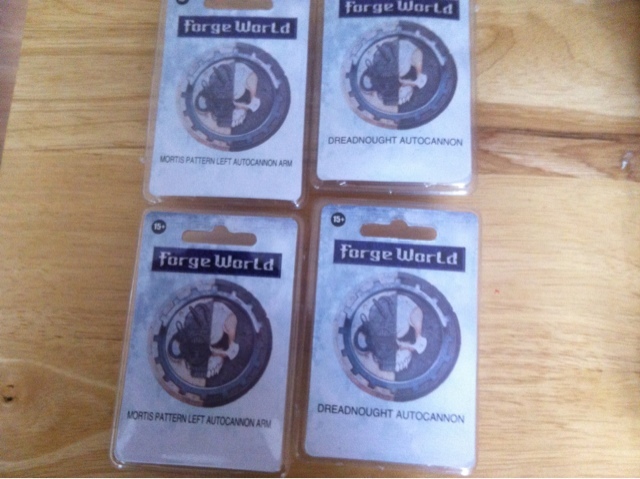 Guess all Deathwing armies were battering someone at GW HQ! But in all seriousness, I think anyone looking for another ruling was kinda pushing it. Shame, but them's the breaks. So, some good, some not so hot. It's not exactly the end of days that some on the internet are claiming, probably due to the PFG ruling, but seeing how many you can fit in an army it was always going to happen. I can safely say that the Ravenwing Command boost makes me want to buy another Black Knight box, so I guess that's a win from GW's perspective. Yay for painting more Black Knights! There's never enough Heavy Support slots. A distant howl. 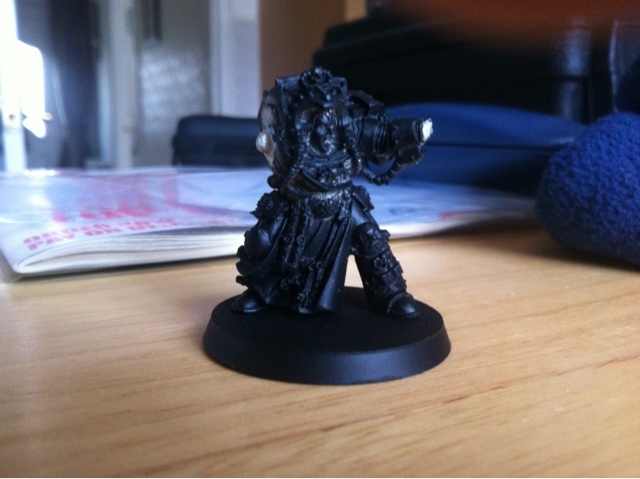 Also, I've got my Grand Master rebuilt. He's got the Nemesis Force Halberd I planned to give him finally, and having put his other arm on, he's looking like a bit of a badass. I'm sure that notion will get disproved in my next game with the Knights, as he's bound to get splatted by a lascannon or something, but that's half the fun! And finally, I'm aware that there's been a bit of a lull in my painting, due to lots of building and sorting my armies. I'm hoping this will change soon, and having three armies to rebuild, paint and play with will mean a cracking variety of posts! 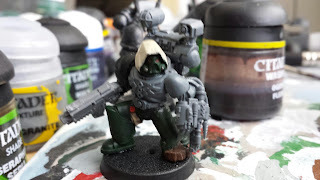 I've torn through painting my Vindicare Assassin, and it was done so quick, I didn't even have time to take WIP pictures. Altogether, he took an hour to paint. That includes washes! Was a really nice model to get to grips with, and he really just painted himself. Made me miss metal models, having not painted any for a long time, and although I know Finecast means more interestingly posed models can now be made, I do wish it was as fun as metal is to paint. It's also nice to get 145 points done so quickly, and having a whole unit complete as well. Killing two birds with one stone! 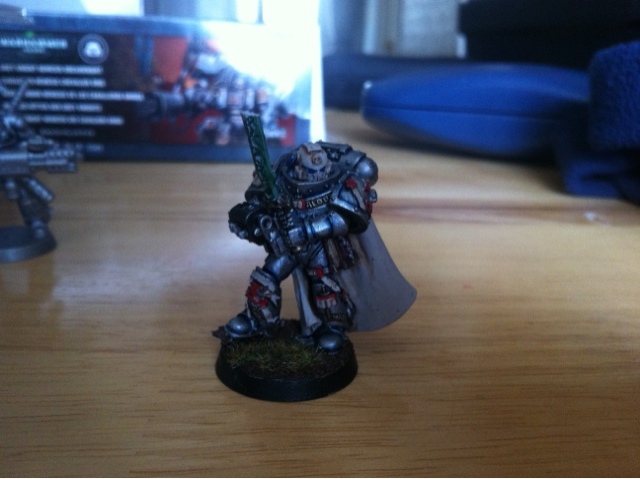 So, 16 years after I bought him, here's my fully painted Vindicare! Also, a quick WIP of Squad Sahrael. Very basic at this point, and the real work will begin once I get the robes washed. 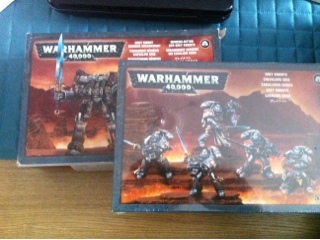 But they're started, and hopefully will be a bit quicker than my Black Knights. Squad Sahrael of the Sixth. Brother Knight Aneases walks. Exitus Acta Probat. The Nerd League finishes. So with the Black Knights finished, it's time to look at what will be next for the Dark Angels. And that, as seen below, is Tactical Squad Sahrael. This is a ten man squad with a Plasma Cannon and Plasma Gun, which I've been running with great results in my recent games. They will be a pleasant change from painting massive amounts of black, and will help get a large chunk of my army finished as well! They do have a Rhino as their transport, but I'll tackle that after I complete these guys. After these and their Rhino are doneI'll be cracking into my Darkshroud, The Lion's Shade. 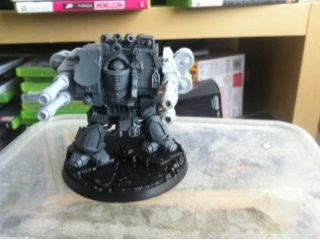 The first of my two Grey Knight Dreadnoughts, Brother-Knight Aneases has been built. The Venerable Dreadnought is a great kit, and gives you lots of extra bits. 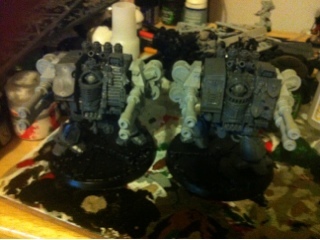 However, I decided to Knight up my Dread by using bits from the Grey Knight, Grey Knight Terminator and Dreadknight kits. 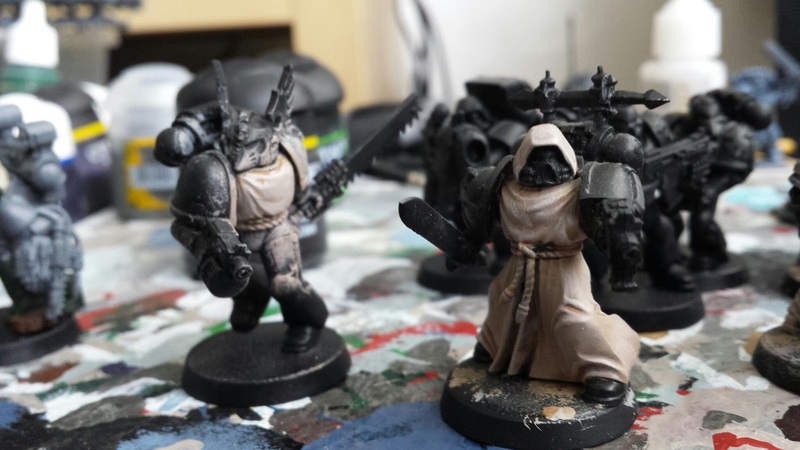 It's mostly purity seals and shields but I also made sure he had an appropriate head from the Terminator kit to make him appear part of my strike force. Looking forward to getting some paint on him, and I'll be working on him at the same time as Squad Sahrael to make sure I don't get bored with either. 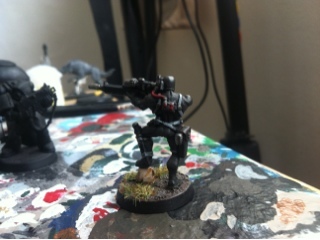 I remembered that I had an old, badly painted Vindicare Assassin in my bits box, and thought he could use some love. I dug him out and stripped his bad paint job using Fairy Power Spray (an absolute godsend. I use it to strip paint from any models including plastic). I'm not sure what colours to use, but am thinking that Charadon Granite would look especially good on him. He'll be useful in my Knight army to snipe out sargeants and special weapon guys from enemy squads. 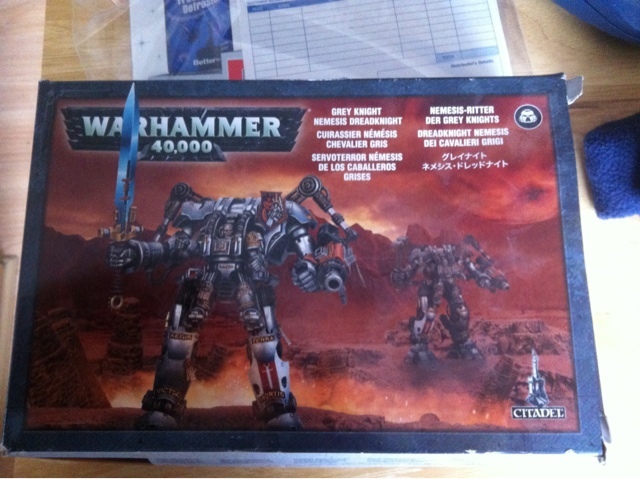 As a side note I remember buying this model at Games Day...1997! It's been that long! And finally, we played the final round of the Nerd League this week. A tough game for me against Poot's Tyranids. It was back and forth all game, and I had to actually think while playing (as anyone who knows me will know, I tend to move first, think later). However, my firepower started to take its toll, and Poot struggled to throw the numbers he needed at me. I focused on his Tervigons, killing two out of three, leading to hordes of Termigants being removed from the table in the process. After five hard fought, tense turns, the game ended with a convincing 19-12 win to me, meaning I won the league without a loss! This was a surprise to me as in the previous League I had come stone cold last, but it shows that by learning both your army, and creating an effective, balanced list, anyone can do much better in their gaming. 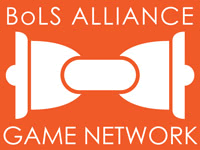 This means that we're not going to be playing the Nerd League for a couple of weeks to give ourselves time to recoup, play some fun games and then start list building for the next League. However, I'll be trying my Standard of Devastation list and seeing how that copes. With any luck my Angels can defend their streak and bring honour to the Lion. Failing that, the Deathwing can catch some Fallen from Gandy. 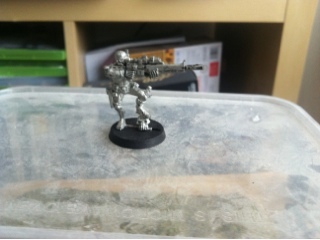 Hopefully Danny will have his new Tau ready by that time, throwing in a new and dangerous army as well. 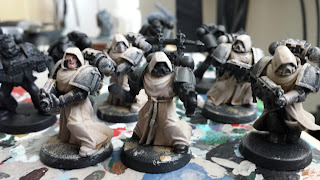 Now, question time...what shall I paint next for the Dark Angels? 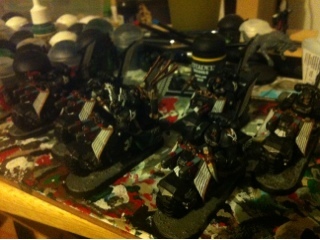 I have 3 more Ravenwing bikes to paint, plus Sammael and a Darkshroud. But I was also thinking of going for a complete Tactical Squad and the Rhino transport. What are your thoughts readers? I now have better pictures of the Knights. Enjoy. The 4th Brotherhood. Nerd League Round Two. 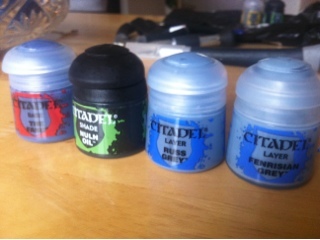 I have been looking at what I need to build/paint to get my Grey Knight Brotherhood up to scratch. 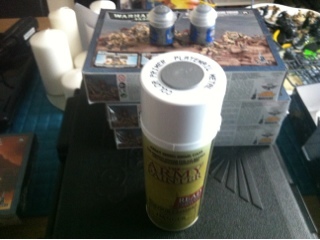 I have been digging through my army case, and have pulled out the following. Castellan Crowe. He's not a massive priority, seeing as he's only in my army to unlock Purifiers as troops (Crowe tax!). 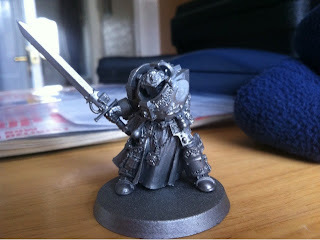 However, his sword was always slightly bent, due to the joys of Finecast, and eventually snapped. Which would have been fine if I hadn't painted him already...! So, new sword time. I'm going to cut off the remains of the sword and look to either use a standard Nemesis Force Sword, or try and look for a suitably Chaotic replacement. Strike Squad Dumias. 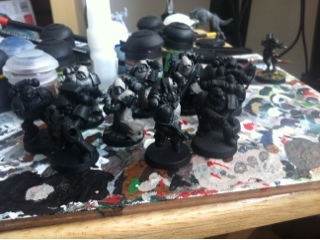 These guys used to be Interceptors, but I realised I had a lack of basic power armoured Knights in any army I ran. So off came the vanes. These guys are what I consider a standard loadout for GK's - a five man unit with a Daemon Hammer and Psycannon, mounted in a Psyback with Heavy Bolter. For under 170 pts you get a unit that can pump out shots and present a strong threat. 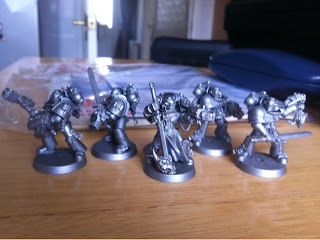 I have ordered a box of Grey Knights and will mix them with the models from this squad to give me two of these units. I also have a Razorback on order. Grand Master Larandis. 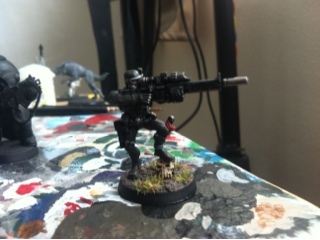 Standard Kaldor Draigo conversion. He does need a Force Halberd though, as the sword is a throwback to 5th Edition when combat was a lot more dangerous, and a 3++ save was the bomb. Nowadays, especially with challenges, being able to kill your opponent before they strike is much more important, and I7 is going to give me that option. Librarian Hyperion. The name is a reference to The Emperor's Gift by Aaron Dembski-Bowden, which I cannot recommend highly enough. It really shows what happens to the Imperium after a massive battle, and the results are not pretty. 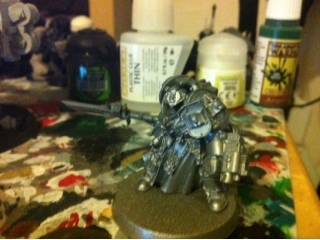 He needs a storm bolter strapped to his wrist, but I'm not sure what Nemesis weapon to give him in his right hand. I really want him to avoid combat, but need to keep him ticking if he gets there somehow. Ideas? 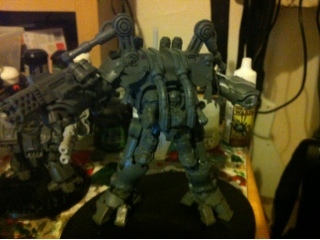 A Dreadknight to be built. This guy will have a Heavy Incinerator , as he will be able to flush out models behind cover using torrent and then beat them in the face. Plus, it's always been a cool model. Always. Round Two of the Nerd League was played last night. Gandy and myself went head to head in an extremely tight game. Poor rolling from myself lead to me having a 5-0 deficit by the end of turn two. However, Sammael did what he does best, absolutely turning the tide of battle. On his own he killed two units of Chaos Marines, a unit of Havocs and took out Gandy's Warlord in combat, scoring three points for this one act alone. In the end the Dark Angels were too much for the forces of the Alpha Legion, leaving me with a 12-7 victory. Two for two, which is about the best run I've ever had :P In Danny and Pootank' game the Tyranid hordes were voracious in exterminating Marines, setting the stage nicely for next week's game to be a decider between Pootank and me. It will be a hotly contested, exciting game, with all to play for! Also, a promise. 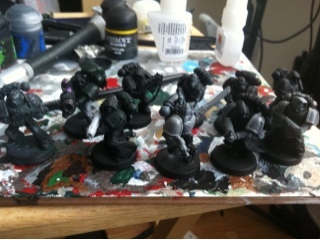 The next post will have my finished Black Knights, even if I have to press gang people into helping me finish them!